AT&T sold a record 10.2 million smartphones in Q4, bringing its postpaid smartphone customer base to 47.1 million and driving overall consolidated revenue for the company to $32.6 billion, up 0.2 percent versus reported results for the year-earlier period, and up 2.8 percent excluding Advertising Solutions and Superstorm Sandy impact. There was an operating loss of $6.0 billion, compared to a loss of $9.0 billion for the same period a year ago. "We had an excellent 2012," said Randall Stephenson, AT&T chairman and chief executive officer. "We grew revenues, increased adjusted earnings per share by 8.5 percent and generated cash from operations at record levels. We used this cash to invest aggressively in the future of our business and returned $23 billion to shareowners through dividends and share repurchases. Looking ahead, our key growth platforms — mobile data, U-verse and strategic business services — all have good momentum with a lot of headroom." Wireless revenues, which include equipment sales, were up 5.7 percent year over year to $17.6 billion. 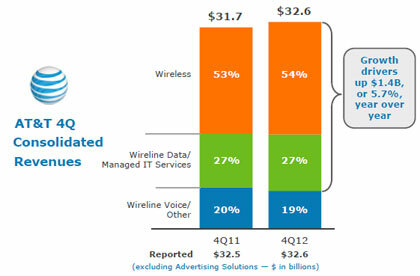 Wireless service revenues increased 4.2 percent in the fourth quarter, to $14.9 billion. 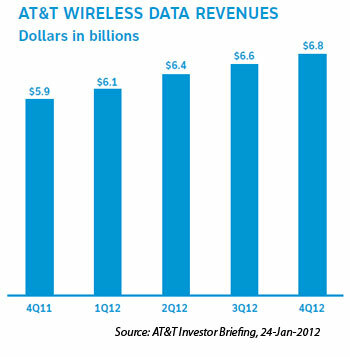 Wireless data revenues increased by 14.7 percent from the year-earlier quarter to $6.8 billion. Data revenue growth was slowed somewhat by the growth of Mobile Share plans. Net adds were 1.1 million, bringing the total base to 107.0 million. Subscriber additions for the quarter included postpaid net adds of 780,000, connected device net adds were 246,000, and reseller net adds were 234,000. Prepaid had a net loss of 166,000 subscribers primarily due to declines in GoPhone and session-based tablets. Postpaid subscriber ARPU increased 1.9 percent versus the year-earlier quarter to $64.98. Smartphones represent 89% of postpaid phone sales. At the end of the quarter, 69.6 percent, or 47.1 million, of AT&T's postpaid phone subscribers had smartphones, up from 58.5 percent, or 39.4 million, a year earlier. AT&T's ARPU for smartphones is twice that of non-smartphone subscribers. About 55 percent of AT&T's postpaid smartphone customers now use a 4G-capable device. AT&T activated a record 8.6 million iPhones, with 16 percent new to AT&T. Postpaid churn was 1.19 percent, down when compared to 1.21 percent in the year-ago fourth quarter. Wireline results were led by strong U-verse TV and high speed Internet gains and accelerating wireline consumer revenue growth. Wireline revenues were $14.9 billion, down 0.5 percent versus the year-earlier quarter but up 0.7 percent sequentially. Revenues from residential customers totaled $5.5 billion, an increase of 3.0 percent versus the fourth quarter a year ago and the strongest growth in more than four years. U-verse continues to transform wireline consumer. IP revenues now represent 61 percent of wireline consumer revenues, up from 53 percent in the year-earlier quarter and 45 percent two years ago. Total U-verse subscribers (TV and high speed Internet) reached 8.0 million in the fourth quarter. U-verse TV added 192,000 subscribers to reach 4.5 million in service. U-verse High Speed Internet delivered a fourth-quarter net gain of 609,000 subscribers to reach a total of 7.7 million, helping offset losses from DSL, and for the first time, the company has more consumer U-verse High Speed Internet subscribers than DSL subscribers. Overall, AT&T wireline broadband subscribers were flat; however, total broadband ARPU was up more than 10 percent year over year. Fifty-five percent of U-verse broadband subscribers have a plan delivering speeds up to 12 Mbps or higher — up from 46 percent in the year-ago quarter. About 90 percent of new U-verse TV customers also signed up for U-verse High Speed Internet in the fourth quarter. About 70 percent of AT&T U-verse TV subscribers take three or four services from AT&T. ARPU for U-verse triple-play customers was more than $170, up year over year. U-verse TV penetration of customer locations continues to grow and was at 18.7 percent at the end of the fourth quarter. Total business revenues were $9.1 billion, down 2.1 percent versus the year-earlier quarter and up 0.6 percent from the third quarter of 2012.
Business service revenues declined 2.3 percent year over year and were up slightly sequentially. Business revenues were impacted by a slow economy and weak government and business spending. Overall, declines in legacy products were partially offset by continued growth in strategic business services. Revenues from strategic business services, the next-generation capabilities that lead AT&T's most advanced business solutions — including Ethernet, VPN, hosting, IP conferencing and application services — grew 10.6 percent versus the year-earlier quarter, continuing trends in this area. Total business IP data revenues grew 2.4 percent year over year, continuing the transition from legacy data products to next-generation data services. 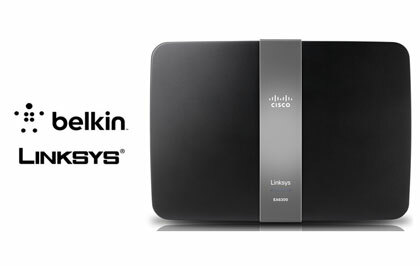 Belkin agreed to acquire Cisco’s Home Networking Business Unit, including its products, technology, Linksys brand and employees. Financial terms were not disclosed. Belkin, which is headquartered near Los Angeles, is a privately-held company with more than 1,200 employees in 21 countries. It offers a similar portfolio of networking products for consumers and small business. After the transaction closes, Belkin estimates that it will account for approximately 30 percent of the U.S. retail home and small business networking market. "Our two organizations share many core beliefs – we have similar beginnings and share a passion for meeting the real needs of our customers through the strengths of an entrepreneurial culture. Belkin’s ultimate goal is to be the global leader in the connected home and wireless networking space and this acquisition is an important step to realizing that vision," said Chet Pipkin, CEO of Belkin. In March 2003, Cisco Systems acquired The Linksys Group for approximately $500 million in Cisco common stock. Linksys was founded in 1988 in Taiwan and now has its headquarters in Irvine, California. The upgraded network is using Ciena’s GeoMesh solution based on the 6500 Packet-Optical Platform powered by WaveLogic 3 coherent optical processors and optical bypass. The TGN-A will also be equipped with Ciena’s GeoMesh solution. The deployment marks Tata's first 100G upgrade on its global submarine network. Tata Communications’ Global Network (TGN), which consists of 210,000 kilometres of terrestrial and subsea network fibre, reaches countries representing 99.7% of the world’s GDP. The TGN IP Transit Network (AS6453) makes up 20% of the world’s internet routes and carries 4,200 Petabits of traffic per month on its Internet backbone. Ciena said its WaveLogic coherent receiver technology enables unobtrusive 40G/100G upgrades to existing submarine networks with only the addition of new terminal equipment, significantly extending the life of existing cable plants and further lengthening their lifespans into the future. 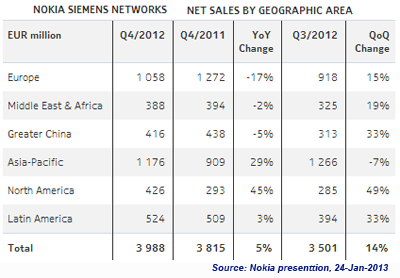 Nokia Siemens Networks reported its best quarter ever in Q4 2012 with an operating profit margin of 14.4% and rebounding sales in North America and Asia Pacific. In its quarterly financial statement, Nokia confirmed the turn around performance at Nokia Siemens Networks as the company achieved higher sales of both infrastructure equipment and services, partially offset by a decline in sales of business areas not consistent with Nokia Siemens Networks' strategic focus. Regionally, higher net sales in Asia Pacific were driven by Japan, which saw strong growth in sales of both infrastructure equipment and services, as well as in North America which also saw strong growth in sales of both infrastructure equipment and services. However, there were lower sales in Europe, most notably in Western Europe due to declines in sales of both infrastructure equipment and services. The company also noted that Nokia Siemens Networks is aiming to reduce its non-IFRS annualized operating expenses and production overheads by more than EUR 1 billion by the end of 2013, compared to the end of 2011. The operating improvement is more than the previous target of EUR 1 billion. One other note: at the end of Q4, Nokia Siemens Networks had approximately 58,400 employees, a reduction of approximately 15,300 compared to fourth quarter 2011, and approximately 2,200 compared to third quarter 2012. 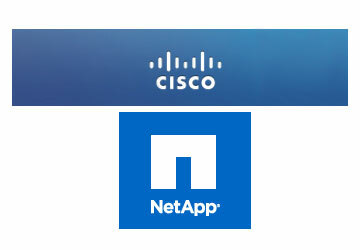 Cisco and NetApp are expanding their FlexPod partnership to deliver unified branch office, data center and public cloud infrastructures. The partnership expansion includes efforts in technology integration, solution development, and continued go-to-market collaboration – all designed to make it easier for customers to deploy and access next-generation cloud infrastructure solutions. The FlexPod data center platform is a prevalidated solution combining storage, networking, and server components and integrating them into a single flexible architecture. FlexPod components include NetApp unified storage systems, Cisco Unified Computing System servers, and Cisco Nexus fabric. The companies said they now have more than 2,100 FlexPod customers across more than 35 countries and over 700 channel partners. 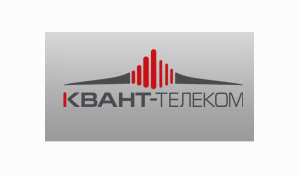 Russia's Kvant Telecom has selected Ekinops' optical transport equipment to provide coherent 100G transmission between Moscow and the Ukrainian city of Kharkov. The 100G service is deployed over an existing DWDM system. Kvant will now be able to offer 100G services for its diverse domestic and international customers. Eutelsat Communications introduced its Air Access aeronautical mobile service with speeds of up to 100 Mbps per airliner in the sky over Europe. This will support top-quality Internet access, videostreaming and GSM services via tablets, smartphones and laptops for airline passengers. Eutelsat Air Access, which will be available from mid-2013, uses ViaSat SurfBeam 2 technology and Eutelsat's KA-SAT high throughput satellite, which delivers a total capacity of 90 Gbps. The footprint covers Europe and the Mediterranean Basin. Eutelsat Air Access is working with LiveTV, a leading provider of live in-flight entertainment and connectivity services for commercial airlines. LiveTV will provide, integrate and maintain on-board equipment and operate Wi-Fi internet access services and video streaming for passengers. As a pioneer in the expanding market for live in-flight entertainment and connectivity, LiveTV has already equipped more than 700 aircraft around the world. "We believe that in-flight connectivity is a strong growth market and are ready with the latest technology and strong partnerships to address this business. Over the next 10 years the number of aircraft offering in-cabin entertainment and connectivity services via passenger devices should grow by more than 50% a year in Europe and the Middle East, and more than 80% in Asia and the Pacific," commented Eutelsat's CEO, Michel de Rosen. The Data Center Switch market will approach $16 billion by 2017, according to Crehan Research, as Ethernet, including Fibre Channel-over-Ethernet, becomes an ever-increasing portion of the overall market. The recently published Data Center Switch Long-Range Forecast Report, anticipates very strong growth for both 10GBASE-T switches and 40 Gigabit Ethernet-capable switches (40GbE). The report predicts robust increases for 100 Gigabit Ethernet Switches (100GbE), but indicates that while 100GbE will likely be an important long-term data center switch technology, prices and port densities have a way to go before it achieves a meaningful market impact. Infiniband switches will continue growing at a much faster pace than the overall data center switch market. Infiniband recently enjoyed one of the fastest speed transitions seen in data center networking, with FDR (56Gbps) comprising a majority of ports about one year after initial shipments. 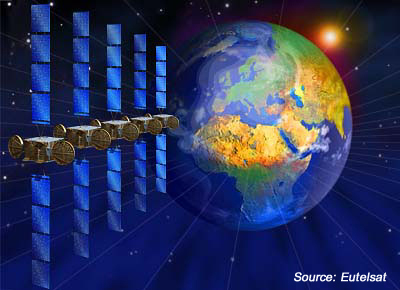 The Fibre Channel switch market is reaching a plateau. However, shipment declines are expected to be gradual as Fibre Channel remains a key datacenter storage networking technology. 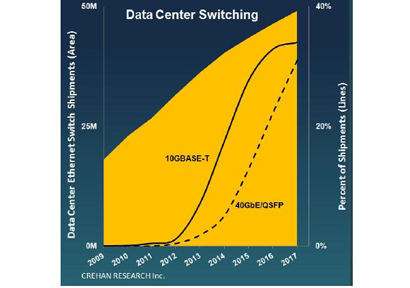 “Given the mid-2012 step-function increase in 10GBASE-T server adapter and LAN-on-Motherboard shipments and subsequent introduction of numerous attractively-priced 10GBASE-T data center switches, we expect exponential growth in 10GBASE-T switch port shipments,” said Seamus Crehan, president of Crehan Research. “We believe the strong ramp in 40GbE will be driven by the following factors. First, the upgrade to 10 Gigabit Ethernet (10GbE) switches in the server access layer should drive 40GbE deployments in the uplink, aggregation and core sectors of data center networks. Second, 40GbE, with its QSFP interface, also can be used as four individual 10GbE links which not only provides very high 10GbE switch port density but also gives uplink/downlink and oversubscription/wire-speed flexibility,” added Crehan. Guavus, a start-up specializing in big data analytics for carriers, has acquired Montreal-based Neuralitic Systems, which offers mobile data monetization and marketing solutions. Neuralitic provides deep-dive analysis into mobile data, enabling Communication Service Providers (CSPs) to generate new revenue streams by improving decision-making aimed at subscriber acquisition, conversion and retention. Guavus’s applications provide insights across network, device, content and subscriber analytics. Neuralitic’s application for mobile marketing adds key insights into subscribers’ mobile data consumption for marketing decision makers. Guavus said the combination of Neuralitic’s applications for mobile marketing with its own network and customer care applications would help CSPs to attain timely and actionable insights that optimize business operations. Earlier this month, Guavus closed a $30 million round of new funding to support its big data analytics solutions. Guavus claims two of the top three mobile operators and backbone carriers in the United States utilize Guavus Big Data analytics solutions. The company is based in San Mateo, California with R&D in India. The funding round was led by Investor Growth Capital (IGC) with participation from QuestMark Partners and previous investors Artiman Ventures, Sofinnova Ventures and Intel Capital. Juniper Networks' net revenues for the fourth quarter of 2012 increased 2% sequentially and on a year-over-year basis to $1,141 million. Operating margin for the fourth quarter of 2012 increased to 11.5% on a GAAP basis from 3.8% in the third quarter of 2012, and decreased from 11.9% in the fourth quarter of 2011. GAAP net income was $96 million, or $0.19 per diluted share for the fourth quarter of 2012. "Juniper finished 2012 on a good note, setting the stage for growth in 2013," said Kevin Johnson, chief executive officer of Juniper Networks. "During the past year we strengthened our product portfolio, took key steps to drive operational execution, and allocated capital in a balanced way. We believe Juniper is entering 2013 in a strong position, with good opportunities in routing and switching and a greatly improved Enterprise security portfolio as we continue to deliver on the promise of the high performance network." 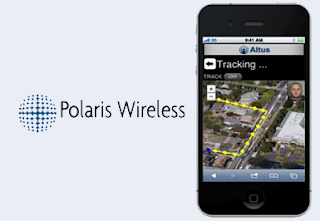 Polaris Wireless, a privately-held company that supplies high-accuracy, software-based wireless location solutions to wireless operators, law enforcement/government agencies and location-based application companies, announced a record increase in revenue and profitability in 2012, where revenue grew 79 percent year-over-year, and profitability (as measured by EBITDA) increased six-fold. Polaris Wireless said its strong results reflect sustained returns on new sales bookings starting in 2011. Twenty-four U.S. wireless carriers, six managed services partners, and fifteen international deployments now rely on Polaris Wireless location solutions to enable emergency call applications, lawful and mass location surveillance, and other location-based services. 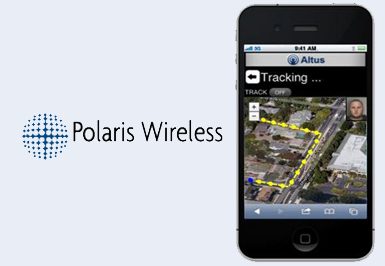 "In 2012 Polaris Wireless continued its upward trajectory as it solidified its position as the foremost provider of high-accuracy wireless location solutions for mission critical applications," said Manlio Allegra, president, CEO and co-founder of Polaris Wireless. "We have been recognized by law enforcement and other government agencies, as well as by business media and industry analysts, as the leader in our field, a role we intend to continue to occupy in 2013 and beyond." Anuta Networks, a start-up based in Milpitas, California, with R&D in Bangalore, India, announced its plans for network service virtualization for delivering on-demand, anytime, anywhere network services for cloud. Anuta Networks is developing a "nCloudX" platform to simplify and automate services in complex, heterogeneous, multi-vendor, multi-hypervisor and multi-device networks, including physical and virtual infrastructures in both private and public cloud deployments. The goal is to reduce delivery time for deploying multi-tenant networks and services. Anuta Networks is headed by Chandu Guntakala, who previously co-founded Jahi Networks, which was acquired by Cisco in 2004, co-founded Nipun Net Solutions in 2002 and was responsible for establishing the first wireless business partner in South India for Cisco.